First in class, that’s Paeonia Class Act. 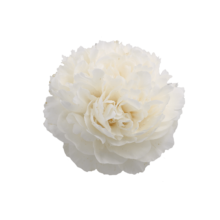 It’s one of the coarsest white peonies in our collection. The huge buds betray the eventual size of the flower. The beige leaves will eventually turn bright white. Class Act starts out beige in colour, with a red line running through it. During blooming, the full-petalled flowers will turn white and have a magnificent rose-form. The peony has a sweet, strong fragrance and firm, thick stems. The bud of Class Act can grow 50 mm wide and its flowers can become 18 cm wide. It really is a peony of substance. Paeonia Class Act was bred in 1980 and registered in 1990 by Roy Klehm. Sadly, more information about its ancestry isn’t available. Class Act is a beautiful peony that requires a lot of care while growing. It’s important to cut this variety at the right stage of maturity. The rose formed flowers won’t open properly when picked to young. The growers who master patience master anything else with this variety. Cutting them in perfect shape is craftsmanship and the result will definitely be a work of our art.